Unexpected, but VERY welcome upgrade! Today, I went in to GameStop, my coveted gaming hidey hole, to trade in some old games that were collecting dust on my entertainment center and I got a surprise. Sure, I’m like everyone else and watch TV, but hadn’t seen any of the commercials about their new rewards program. How does it work? What is it? Are there options? Does this make my EDGE card completely useless? Is there anything new? If you’ll hold on to your controller long enough, I’ll tell you about GameStop’s revamped and exciting new system that has improved on their age-old program. The first and most important thing to mention about this new program is that it is a BETA!!! So unfortunately, they could decide to scrap this thing all together if it makes them lose money or they just don’t like the way it turns out. This isn’t very likely, as GameStop has managed to greatly strengthen its core values and its customer base in the last decade. But I suppose telling you this program is a beta isn’t good if you don’t have a name: Power Up Rewards. 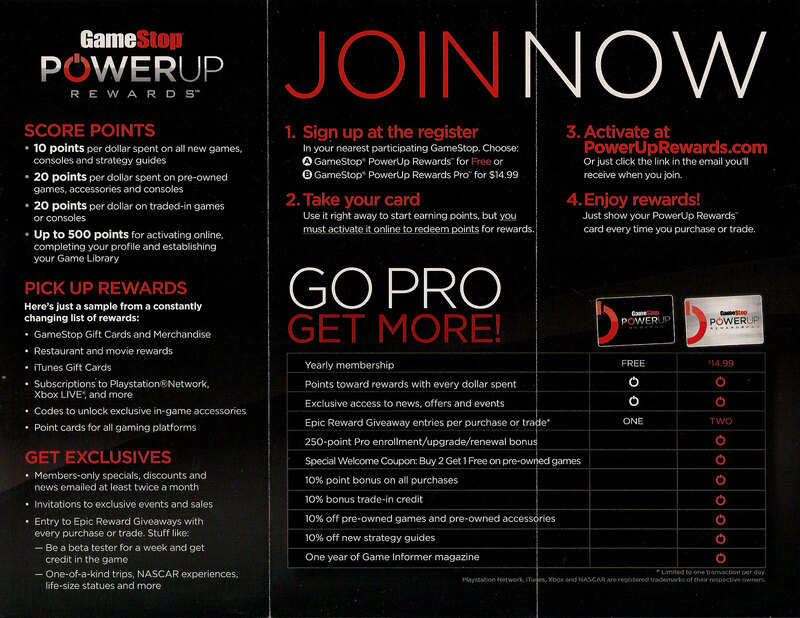 The Power Up Rewards program is the newest expansion on the EDGE system that GameStop (which includes its merged arms of Babbage’s and EB Games) has used in the past. The new program completely replaces the EDGE system that they’ve been using in favor of MASSIVE upgrades and even some options. Below are your two options, depending on if you want something more cost effective or if you prefer the entire birthday cake. The first option is the basic program, the Power Up Rewards. The name in itself becomes a bit misleading for those of us that have had EDGE cards for years. 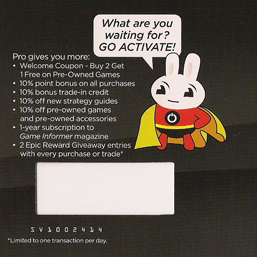 Many of us have often wondered why we had to shell out $15/year to get, granted, some nice rewards, but also a Game Informer magazine that could be hit or miss based on our tastes. This option is definitely for the person that doesn’t want to shell out money, but it comes with a trade off. What are the highs and lows of this program? FREE FREE FREE! The $15/year cost in this program is gone, in favor of players actually being able to just have some kind of advantage without the cost 000or the magazine. This is likely to get the attention of the college (a.k.a. “poor”) gamers, and the money- sensitive parent. Unfortunately the free option, while allowing you to save some extra money, also takes away some of the extra bonuses that you’ve become accustomed to over your years as a gamer. For those of us that often traded in or saved enough money under the EDGE program for other goodies, these rewards were very well worth it, and in time paid for themselves. 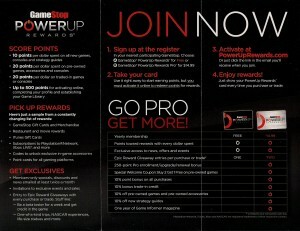 Which brings us to the second option: Power Up Rewards Pro! What comprises this program? This IS your old EDGE card, but with new upgrades. As you can see, Rewards Pro is an expansion of the old EDGE program, and gives you some additional things other than just a cool magazine. You’re probably wondering how the points work, and if it converts the money that you get when you trade in, which would mean you lose it. First, I’ll dispel that fear of losing your money. The money you traded in for is still yours and is NOT converted to the points system that you are getting. That system is still the same. So, just what are the points? 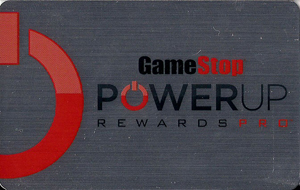 Think of them as a customer loyalty program just for being part of the GameStop consumer base (yes, they are following the rewards model of many other companies that we know and love….or loathe.) These points are accumulated base on the amount of money spent or traded in for at GameStop. 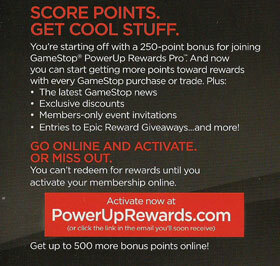 You get 10 points for each dollar spent on new stuff, and 20 on pre-owned games and consoles. These points add up online, and can be redeemed at a later time for the cool stuff that you want, all while keeping the money that you got in the store for your trade-in….double the rewards, and better than Capital One and Peggy (of USA Prime Credit!) So, if you have your EDGE card, trade it in the day after Christmas when you go get your new games, and tell them that you want the new Power Up Rewards Pro, because to upgrade your EDGE card is FREE!